Trauma affects nearly every area of a person’s brain. Not only that, but trauma disrupts the connections in the brain. And when the brain isn’t integrated, it impacts the nervous system and the entire body. So how can we work with clients to repair integration after trauma? In the video clip below, Pat Ogden, PhD shares the approach she used to help a client integrate his brain and stay in the present. 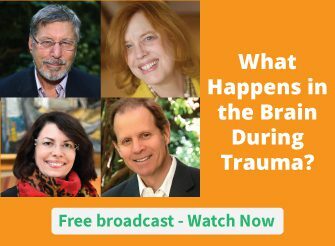 You can hear more from Pat, together with Bessel van der Kolk, MD; Dan Siegel, MD; Stephen Porges, PhD; and Ruth Lanius, MD, PhD in the Treating Trauma Master Series – it’s free to sign up. This week they get into what’s happening in the brain during trauma. They’ll look at how the hormonal response to trauma affects brain function, as well as how trauma affects gene expression. How could you use these ideas in your work with clients? Please share your thoughts in the comment section below. This will be most helpful once the client feels able to express those emotions. Good rapport will have been built by then to enhance that spirit of “community”. The physical movement, coupled with the safety and engagement of the therapist, should really help the client to begin to understanding self regulation. There were many interventions going on at the same time, prevention of dissociation, social engagement, and body movement for working with a memory; for brain integration as the primary motivation. Pat seems very engaged with the client as well, something great to see, the therapeutic relationship in action with trauma. Am interested in the application of this approach with clients prone to self-harm. Thank you for more helpful sharing ! ANd what if the trace of trauma is dissociation? Thanks for posting this video. The techniques shared will be helpful in teaching students who come to yoga seeking relief from anxiety and depression. I am a yoga teacher, and a firm believer that the origins of depression/anxiety can be traced back to ill-resolved life junctions. For example, a ‘breakdown’ may occur at the fork in the road which is experienced as a student leaves home and sets up house for himself. He maybe unable to cope with the stresses of college, food, laundry, etc. Students experience this ‘coming-apartness’ as trauma, and the techniques shared in this video will be instrumental in helping. I deeply admire Pat Ogden and am sure to use all I can learn about trauma. One of mine who suffers from almost daily anger and frustration. Would like to learn all techniques to be able to recognise it quicker, control it, stop the immediate spiralling of negative criticism in their thoughts which usually end up telling them theyre a failure and not doing enough, not doing it right and not doing it quickly enough? Am I the only one concerned about the potential abuse of using these techniques, as well as the risk of misinterpreting these very short clips, especially by novice therapists? I assume that the client Pat Ogden is working with is an established client with whom she has a solid therapeutic relationship, but I think that this needs to be stated. Years ago, Richard Kluft said you can NEVER assume your client trusts you. I have over 35 years of experience, but this intervention greatly concerns me! I am familiar with these tools, as a somatic therapist who works with energy is truly important for me to create a safe and sacred space for clients to be fully present in their body while exploring an emotion within self and observe the multidimensional parts of themselves to understand at a deeper level what is truly happening. From this place of fully presence and safety they can give themselves full permission to transcend, uncreate or let go of the trapped emotion attached to the trauma. The techniques named are familiar to me but it is good to have them articulated again. The use of the soft object to provide safe catharsis is interesting and one I will consider. I use a similar movement to the one the client described to me already sessions, but not with a ‘contact full, third’ object. This will take a trust of the relationship and the containment suggested by it. Please caption your videos to make them accessible to Deaf people. Thank you! This is observation of repressed rage from being in an abusive marriage relationship for years. Almost 18 years after the divorce, the traumatized ex-wife is feeling empowered to express her rage towards her ex-spouse. This is being done in a vigorous, articulate , and non-destructive manner, face to face. There appears to be a sense pf release, calming and healing for her. The ex-spouse continues to feel justified in his past abusive behaviours without acknowledging his wounding effect on the family. He is having difficulty taking responsibility for his actions. In the meanwhile the mother and adult child continue to do their trauma work. The father has their compassion knowing that he suffered trauma in his family of origin. I once heard from someone that group imagery sessions did not work for her. I had been do individualized imagery for a while and found it valuable as I do it. Now, I am an advanced student in the Bonny Method of Guided Imagery and Music. This is part of the technique, exploring imagery and reporting everything that is experienced. One reason why it works so well. I am so delighted to see it backed up here with brain science. Thanks again Ruth and Pat! I’ve begun to use the technique of having clients stay with the feeling in their body and at the same time telling me about how it feels and such descriptions of it’s size and it’s color. This has certainly been helpful for clients. I encourage them to do this at home when they’re feeling a surge of emotion, Some clients have done this, but some clients struggle to remember to do so at the time and continue to let emotions, especially fear, to overwhelm them. Each time I have a session with the latter clients, I work with them on being mindful of their emotions, and keep encouraging them to do this when not with me in the office. I’m hoping to find more ways to assist clients in being able to independently use integrating techniques. I hope as you find more ways to assist clients in being able to use integrating techniques independently you will share them. Have you considered “Tapping?” I think it’s great you are encouraging clients to build independence. I’m aware of descriptions of size and color for pain-how interesting to link it more specifically to the emotional surges. Thanks for sharing your comments. Hello Ruth, I use this approach with clients and it is generally helpful, however I am currently working with someone so afraid of her emotions that although we have made significant progress, and she is beginning to bring anger into awareness and acknowledgement in session, she is so terrified of this emotion that it is v hard to maintain engagement. Slow work. Is patience and persistence the only route? Hi, I am a traumapsychotherapist from Finland. I am also a physiotherapist. This video from Pat Odgen came just in time for me. I have a client I have been working for a long time. She is very dissociative and we have worjed a lot to increase her mindfullness awareness, to stay in present. During last session she said to me, that she can feel something very big, strong feeling coming. That she is very afraid of that feeling bcause she feels it´s related to death. She also mentioned, that she can make it go away or she can make it happen. Last time when it happened with her former therapist, she (client) bursted out of the room and made a hole with her fist into the door. Now…I am thinking of trying to this technic Pat showed in the video. I will talk through it first and see how see reacts. This neuromuscular engagement revisiting the physical and psychological trauma incident in a socially-engaged relation resonates very strongly for me when considering a friend who suffered severe trauma 40 years past and his still unintegrated primitive brain reactions that can trigger weeks of dysregulation. He is undergoing weekly DBT and reconditioning his brain patterning gradually with mindfulness and reflexivity (to better prepare him to avert triggers). Yet to expedite this therapeutic process, this physical/dialogical/psychological engagement interrelationally is clearly key to working through unresolved and hypersensitive pathways that remain unintegrated. I feel he is ready for this therapeutically yet his treatment is going slowly. Yet he will be in a better position if he is conscious of this at least theoretically. Would you comment on what methods of reflexivity you are referencing? hi, I like the combination of mindful movement and repair of the social nervous system. I use storytelling for healing trauma telling a myth I wrote of a mermaid recovering from shock. anyone one else do storytelling? Yes, I find that sharing stories with clients often very helpful as it invites the client to work symbolically and this seems to connect more readily with emotion than just talking. I generally explore whatever they bring in response to what have been favourite stories in the past, but occasionally will mention a story or character myself. I am wondering how well versed a patient needs to be in mindfulness before we use this. I would like to use it with a young adolescent suffering from sexual abuse and also a woman who had been physically abused in her childhood. The adolescent is very resistant to mindfulness meditation. Is the goal of this to release the energy stored up in that motion and whatever trauma inspired it? It sounds intriguing, but I would need to know more before I felt comfortable doing what Pat did in a session. Yes, the goal is to help the client follow through with the urge of what the body needs to do in order to help integrate the traumatic experience in the memory banks. Over time, with the right skills such as mindfulness, we can help people stay with engaged in the present as much as possible in order to avoid disconnection from bodily sensations and emotions. I need help from numerous traumas. I have night terrors and I don’t go outside or even open my blackout blinds. I’m having councelling but it brings up feelings that I just can’t cope with and I feel as though I’m going to lose control, like an emotional tsunami so I don’t feel it helps. Hi Charlie, have you been assessed for PTSD or CPTSD (complex as in trauma experienced in childhood ….attachment/interpersonal). With your ‘intrusive’ symptoms of night terrors it sounds probable. If you have ptsd then counselling will make it worse….none directive therapy is not recommended (google NICE guidelines for ptsd). EMDR or Trauma Focused-CBT are recommended. I’m trained and Accredited in both and think EMDR is the better therapy for many reasons….more whole body/brain integration. Look up EMDR on the EMDRIA website. Best wishes for recovery. Where do you practice Heather? I have received this kind of treatment during a session with my pyschotherapist for PTS after recently bereaved from suicide. it has not healed my grief – that is a life long journey – but it has definately helped me manage the stress and anxiety of passing the accident site daily – tuning in to the sensation – letting it flow through rather than stuck in it , or secondary reaction , or reaction as I anticipate. So emotionally not healed but physiological reaction lessened and metal trauma lessened. Do you know of any experts in PTSD, complicated grief and Trauma in Sydney NSW? I am not a Therapist, but have always been interested in what you are teaching.. not only for my own Benefit, but for those in family, and friends to understand better their behaviour. Thank You. not however a psychotherapist. I have been introduced to this work by my massage therapist who is currently studying this approach to psychotherapy with a view to becoming a licensed psychotherapist. My personal interest stems from painful experiences of a sexual nature when I was a child. While I have led a long and productive life I do reflect on how this has affected my life and relationships. It is lovely listening to Pat. As often as possible I encourage the clients to speak about their bodily sensations while exposition of a trauma. To prevent dissociation that way and staying in contact seem to be very powerful means overcoming a trauma. Thankyou for this useful input. I‘m mainly working with „NET“ the „narrative exposure therapy“. Dr.Ogden has a point in her dissertation, however I would need to study her reasoning for her believe. The following is my opinion only. I find it distracting when listening,to see so many hand movements. It would be most interesting to review further, the logic in treatment,to the benefit that the client/patient receives. As a retired nurse psychotherapist, I think that master therapists have a grave responsibility to caution therapists, especially new therapists, that TECHNIQUES do not replace basic psychotherapy. I have found (by teaching a grad school course) that new therapists want to jump right in & use these techniques before they understand the nature of a therapeutic relationship, the impact of the unconscious, basic listening skills, etc. Remember: “First, do no harm”. I am a practicing psychotherapist and am fascinated to learn more about these techniques. These are very useful and makes a lot of sense to the trauma related issues for a client. They feel empowered and connected to their own self, brain sciences have opened a fresh new avenue. I am not a practitioner. However, I am interested in these developments and outcomes and appreciate learning about them as it is relative to healing results of trauma. I am also doing a little research on EFT (Emotional Freedom Technique) versus EMDR therapies to write about in my college class. As a medical transcriptionist by trade, I have transcribed/edited a lot of traumatic situations. Learning about these different methods of treatment in today’s world is very helpful. I have been a Cousellor/Hypnotherapist since 1992 and like to keep abreast of what other therapies are able to do and how long that takes. Before my clients come for their first session I ask them to fill in a form that I send them by email to tick off a list that would also apply to their past history of negative events. I don’t want them to write how that felt, but to give them a chance to tick boxes that prompt things that might otherwise thought to be not important enough. When they arrive, they have a short overview of how the brain works (Freud’s Iceberg Analogy of the ‘conscious, pre-conscious, sub-conscious and un-conscious. We go through the functions of each, the halt signs and coping strategies. All non-threatening rapport building and interaction. We talk about the history and I ask for feelings around that event. For example, a feeling of Anger, I would then ask for a Subjective Units of Distress zero, a non-event to 10 as high as it gets. Other feelings around that issue is what the client tells me -helpless… guilty… shame… whatever and each is given and intensity. We haven’t actually brought in any feelings into being. EFT us often the what the client chooses to undergo. Most men choose my own version of eye-movement desensitisation where I ask a client to bring in the feeling and when they have it, to open their eyes. They then watch a flashing bicycle light as I move it from left to right a little away back from the front of their eyes. The instructions are that when they feel the feeling disappearing, they close their eyes again and then bring the feeling back again. When they have brought it back to open their eyes again and continue watching the light movement. While they are doing this, I touch them on the shoulder and say; “Disconnect Now”. Using wording like, this is now in the past… They keep doing this until they can’t bring the feeling back anymore. When that happens, they tell me and I ask the subconscious if it is OK that we don’t need to bring it back again. When I get that feedback, the feeling is gone. Checking later out of hypnosis the client is able to talk about their happening without it eliciting any unease emotions. So if I think about the video from Pat, it essentially does the same thing. They are mindful about the feeling, they bring it to the surface, but they don’t need to talk about it. They feel it moving away and are bringing it back for further eye movement that diffuses the intensity each time until they can no longer bring the feeling back. So helpful to watch Pat live as she explains how to work with trauma experiences as the client is retelling it. I would like to hear more about how to explain to clients a reaction of urinating at the time of trauma. I have a few individuals who are much older however they described clearly recalling a fear reaction when they were in late childhood. My potential client is reporting overwhelmed by sensory and mental stimulation from all sources. She experiences constant vertigo, extreme sensitivity to auditory and visual stimuli, etc, and she can bearly function in her limited world. She is bearly maintaining a semi normal life. Medical interventions are challenging on multi-levels; communications, follow through, social, etc. Her world is full of trying to control chaos. Brain/body and any interventions. She is an adult still living at home. In think a person can get passed trama but the individual can not be stuck in a state or place were there every sourounding is deliberately trauma-induced behaviors scenery and situations or misconceptions of assumptions of the ignorant as to what some of the trauma Maybe based on false misconceptions and our information by those seeking to deceive and destroy.